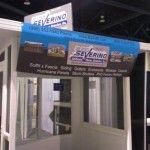 Soffit & Fascia – Budd Severino Advanced Home Exteriors, Inc.
Soffit serves a number of purposes. One of the most obvious is providing a finished look to a home. 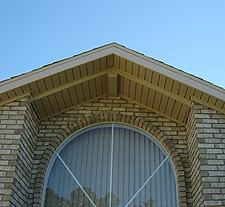 But soffit also plays an important role in helping ventilate attic space. Alcoa vented soffit systems are designed to provide maximum air flow to the attic area, especially when combined with Alcoa ventilation systems. Proper attic ventilation helps keep your home cooler in summer and warmer in winter, saving money on your utility bills. It also helps prevent heat buildup and moisture acclimation that can cause costly damage and deterioration to your roof. Whether you’re building a new home or remodeling, Alcoa offers a wide selection of durable, high-quality vinyl soffit products that complement your home’s beauty. These superior products provide the appeal of freshly painted wood and are available in a wide range of colors. Like all of Alcoa’s vinyl exterior products, these soffit systems require virtually no maintenance. In fact, all it takes to keep Alcoa vinyl soffit looking like new is an occasional rinse with a garden hose. It never needs to be painted and is engineered to last a lifetime, without chipping, peeling, cracking, splitting, rotting or swelling.